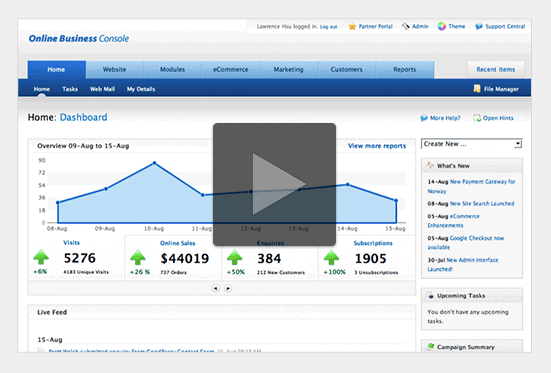 Internet Insight has been helping business owners build online businesses for over 15 years. We've helped hundreds of business owners conquer their Web fears. Our team of professionals have designed, implemented and become proficient in a solution that covers all the bases without all the head ache. Our clients are now Online Business Champions. Our philosophy regarding online businesses is this, you should integrate and streamline every aspect of your online presence. Just as companies have been optimizing and streamlining their internal operations for years, you should be doing the same online. Until now, a complete integrated solution was cost prohibitive. Today we average 50% to 70% less than a custom developed site with the same functionality. For a free assessment or to schedule a live demonstration, please call or email us today. If you want to test the waters on your own our online 30 day trial will allow you to create a new site from scratch, import and copy your current web site or use of our our pre made templates. There is no credit card information needed. Go on, take a site for a test drive! What's it all about? 3 minute video, watch. Copyright © 2010 Internet Insight. All rights reserved.